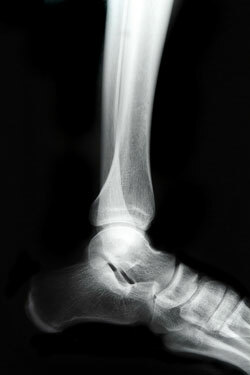 Ankle injuries and other acute medical problems almost always find a way of occurring at the least convenient times. For instance, an athlete will play in tip-top shape for the majority of the season, only to sprain his or her ankle right before the championship game. Likewise, many parents seem to break an ankle just as their toddlers are beginning to run about the house, and some individuals begin to experience intense ankle pain in the days leading up to a long-anticipated vacation. Dr. Mukesh Bhakta, D.P.M. at Prince William Foot & Ankle Center, PC and South Riding Foot & Ankle Center realizes the hassle that ankle injuries can cause his patients, which is exactly why he is proud to offer digital X-rays and ultrasounds from the convenience of his office in Gainesville, VA. At the very least, this will save patients a trip to the emergency room or diagnostic imaging center, allowing them to get on with their lives and begin their treatment regimens as quickly as possible. Many patients prolong a visit to the foot doctor because they assume their ankle sprain or other ankle injuries will dissipate on their own. However, it’s important to have an ankle injury examined by a podiatrist to evaluate whether it warrants a cast, compressive bandage, surgery, or some other specific treatment. Contact us to learn more about the services offered at Prince William Foot & Ankle Center, PC and South Riding Foot & Ankle Center. Residents of Manassas, Bull Run, Centreville, Chantilly, and surrounding areas can also click here to schedule an appointment.